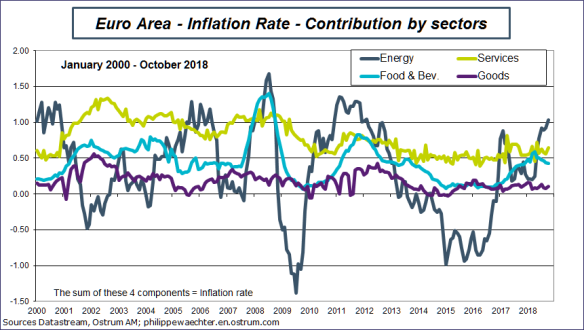 For Waetcher, the lack of external impulse, the slower momentum in the manufacturing sector and the convergence of the headline inflation rate to the core inflation rate are three reasons that suggest that the ECB will not take risks in the management of its monetary policy. The monetary policy normalization, even the expectation of it, may weaken economic activity. Therefore it’s not the good policy when the inflation rate is way below the ECB target with no convergence to the target in a foreseeable future. The framework the economist has in mind is the following: Due to more heterogeneous behaviors and uncertainty at the political level, global growth will become, in 2019, weaker than in 2017 and in 2018. Inside the Euro Area, there are no coordinated policies that may boost growth, therefore growth trajectories will converge to potential growth. This framework is not a source of monetary policy normalization. But we can add that the dramatic oil price drop in recent weeks (due to excess supply in the US and in Arabia) will push the headline inflation rate to the core inflation rate which has been close to 1% for months. 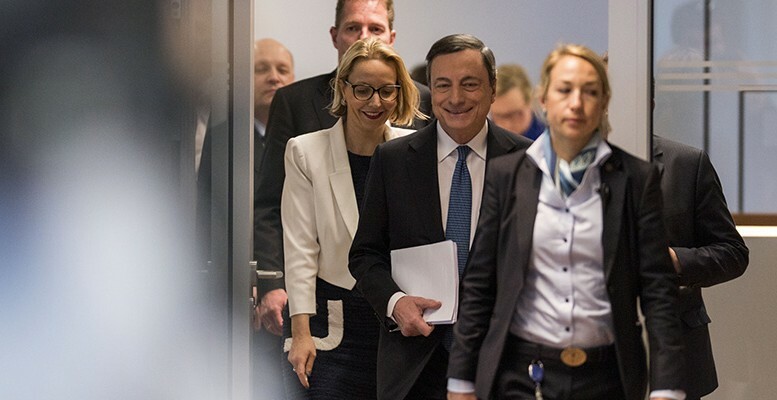 It’s still way below the ECB target and therefore not a source of monetary policy normalization. 1 – The global environment is less supportive. The world trade has now a low momentum and it will not converge to a higher trend rapidly. The graph shows that the world trade growth and the US, Japan and Euro Area average of their new export orders have consistent profiles. It suggests that its dynamics could be lower in coming months. The point is that the Euro Area has done well in 2017 when the impulse from the rest of the world was strong and persistent. In November 2019, in the Euro Area, the new export order, in Markit’s survey, is below 50 for the second month in a row. The impetus from outside is no longer the source of growth. In 2017, the global growth was quite homogeneous between countries whether they were developed or emerging, inflation rates were low and monetary policies were accommodative all over the world with few exceptions (Brazil or Russia). It is no longer the case, the US have a strong fiscal policy that has been a support to extend the business cycle while the Eurozone’s business cycle has peaked at the end of 2017. The oil price has been higher on average and there political uncertainties in many places around the world. In other words, we do not expect that the stable framework of 2017 may come back rapidly. We were in a kind of cooperative game, it’s no longer the case. 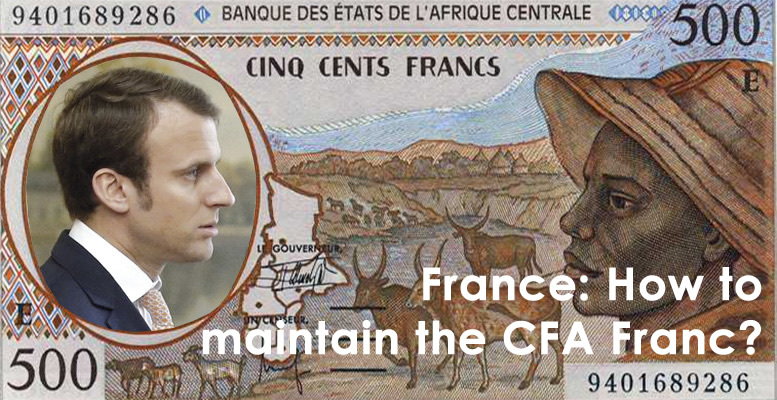 We are now in a framework where balance of strength is the real measure. 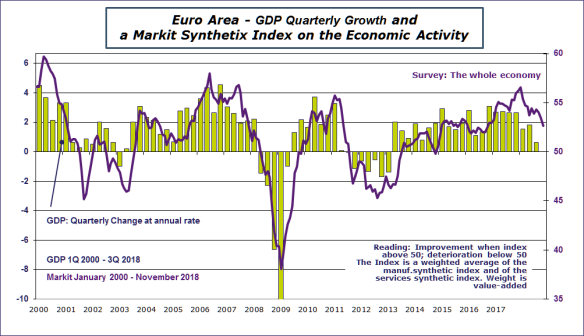 2 – The growth dynamics inside the Euro Area is trending downward. The lack of impulse from outside has not been replaced by a strong domestic momentum that may come from coordinated policies. 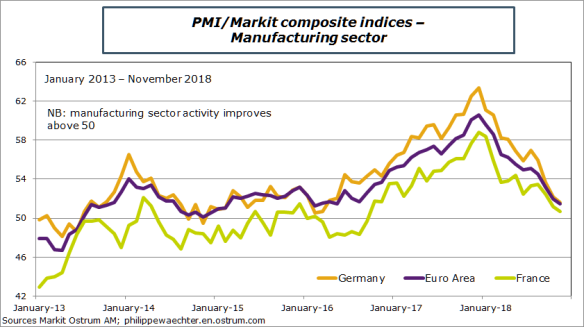 Manufacturing surveys show a rapid slowdown in Germany, France and the Euro Area. 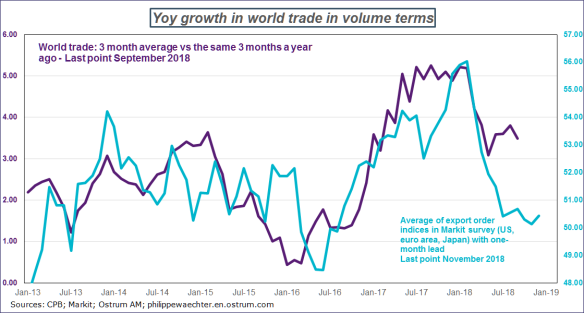 From the December 2017’s peak, the drop is impressive even for Germany which suffers from the weaker world trade momentum. The manufacturing sector is the source of the global dynamics. We cannot have a weak manufacturing sector and a strong economy. It’s an antinomy. This reflects the weaker world trade dynamics. Growth expectations are therefore on the downside. In other words, the Eurozone peak was seen during the last quarter of 2017. Since then the economy is converging to its potential growth which is lower than 2% for the Euro Area. 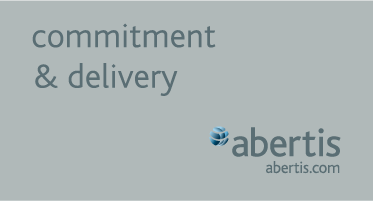 3 – The inflation rate will drop rapidly as the energy contribution will converge to zero. 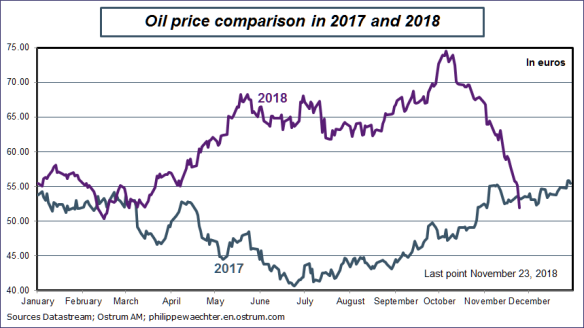 The oil price is currently below its 2017 level at the same date. This means that the strong energy contribution seen since last spring will rapidly disappear. Since last spring, energy was the main contributor to the Euro Area inflation rate. With the rapid drop in the oil price, the contribution will rapidly converge to zero and the inflation rate will be close to the core inflation rate which has been close to 1% for many months. Inflation is no longer a source of monetary policy change.